The NKPR Festival Countdown is an annual sign that the summer is wrapping up and that the Toronto International Film Festival (TIFF) is just around the corner in all of its film, party, red carpet, and late night glory. 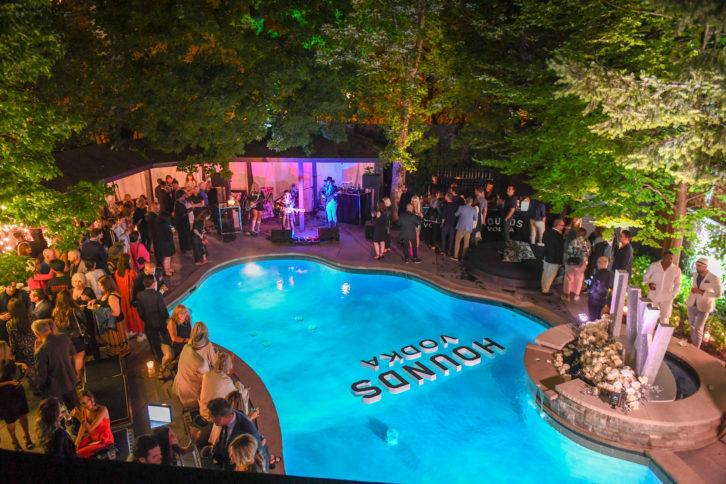 Held in the sprawling backyard of NKPR President Natasha Koifman on Wednesday, August 22, the event officially kicked off the TIFF season for those involved – the media, PR pros, party regulars, and talent. It also marks the start of NKPR’s bustling TIFF schedule, which includes the NKPR IT House, the celeb-filled Artists For Peace and Justice Gala, and the hot-ticket Producers Ball. Upon entry, guests were met with a stunning display of sparkling illuminated Swarovski crystals that were delicately strung from trees. This offered the perfect backdrop for a photo booth by Lise Watier that invited guests to throw all the confetti and glitter their hearts desired for the love of a good photo op (many have since found their way to Instagram). Guests sipped black cocktails thanks to sponsor Hounds Vodka, who kept everyone hydrated with two bars to serve up unique cocktails made with their black charcoal-infused vodka (which was a major conversation piece). Ace Hill Beer and Flow Water were also found at the bar. Naturally, the well-heeled guest list was well feed, with everything from an assortment of Pusateri’s hors d’oeuvres, to a photo-worthy charcuterie spread (complete with live ham slicing and a fresh mozzarella pulling station – heaven) and – later in the evening – individual Tim Horton’s breakfast sandwiches. Meanwhile inside, a Lise Watier makeup station offered makeup touch-ups with the brand’s latest products, and a personalized Lise Watier makeup compact embossed with Swarovski crystal lettering. A welcome addition to the gift bags all guests left with was an assortment of Lise Watier makeup – something that will definitely come in handy during TIFF. Congrats on another great event, NKPR team!